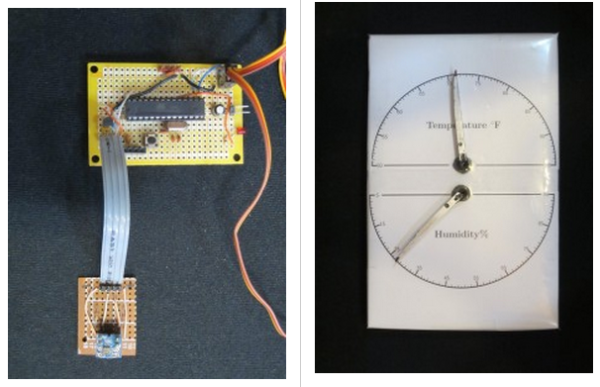 In this post, I will show you yet another thermometer/hygrometer build. But instead of using an LCD or 7 segment display for the output, I decided to go retro, using two “needles” to display the temperature and humidity readings instead. And to make the project more fun, I did not use analog meters for the output but chose to use two servos instead. The temperature humidity sensor I used is SHT21 from Sensirion, the same sensor I used in my temperature logging project before. In that project, the temperature and humidity readings were sent over the network and displayed on my web server (you can see the current readings in my lab here). This entry was posted on Tuesday, April 1st, 2014 at 1:28 pm	and is filed under Arduino, AVR. You can follow any responses to this entry through the RSS 2.0 feed. You can skip to the end and leave a response. Pinging is currently not allowed. Hey, I did something similar but with Adafruits NeoPixels: Spaß mit NeoPixeln. This is definitely a quite intriguing post. bookmarked to my own favorite.